I went to MS Life in 2012, shortly before I was diagnosed. I was full of trepidation before I went, but it was well worth the journey from Cardiff to Manchester. This year it’s in London and I urge you to attend if you haven’t been to one before. I was lucky enough to speak in-depth with a wonderful MS nurse, who guided me through the McDondald Criteria, my symptoms and my options. She answered all my questions and made me feel empowered, which was fantastic as I was due to have a meeting with my neurologist soon after. With what we had spoken about, I felt a lot calmer for the neuro meeting in which I was subsequently diagnosed and DMT’s were brought up. And that’s what it is all about – information. I’m that kind of person, if I know what I’m up against, I’d like as much information as possible. I’m a ‘cover-all-bases’ peep. 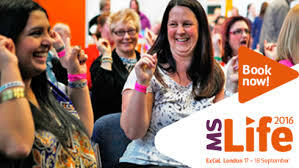 Anyway, back to MS Life – a celebration of MS in all its guises. I collected my bag full of – information – and gathered even more information from various stalls (check out the MS Trust stand – it’s superb) before heading back to my hotel room and reading every single thing. Knowledge is power. Everyone I met at the event was friendly, enthusiastic and helpful. No question was too small or seemingly insignificant. I’d love to attend this year but sadly my finances are limited, however I’ll be keeping up to date with all the talks and events. Please go, if you can. And if you do, could you snaffle me one of the bags you get when you register? Jen Digmann is my guest blogger today. 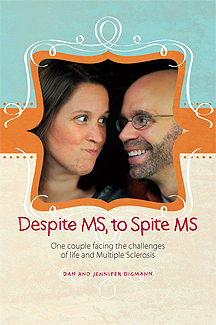 Jen and her husband both have MS and use their experiences to help empower others. Check out their website here. When I decided to marry Dan, I knew there would be a few certainties in my future. I knew I would be hearing and seeing a lot from Mr. Bruce Springsteen. Likewise for baseball games. Both which I’ve done gladly. Another thing I knew was I would become the co-leader of Dan’s MS self-help group. I gladly have done that as well After all, I also am living with Multiple Sclerosis. Something I always tell members of our group is that I firmly believe the more you know about this unpredictable disease of the central nervous system, the better you are able to live with it. Well-meaning advice, but not exactly the most reliable resource. A person with MS can talk with his or her neurologist, check out trustworthy websites like nmss.org or healthline.com, or look into self-help groups. Being the co-leader of one such group for the past eight years has been both a privilege and an awesome way to meet others who understand what I’m living with and to also constantly learn about MS. And sometimes I may think Dan and I know most everything about the disease, but then I realize there is still a lot we can learn. As the meeting was ending, I quipped something about my trigeminal neuralgia, and sure enough Sherri chimed in how miserable that condition is. I never knew she was dealing with this too! It almost felt like a put-on-another-pot-of-coffee-we’re-not-done-yet kind of moment. Don’t you love meetings like that? She and I were talking about this obscure symptom, and our group’s general consensus was: MS is strange like that. This statement led Dan to talk about the tight banded feeling he was experiencing in his midsection. “Yep, that sure sounds like the MS Hug to me,” Dawn and Rhoda enthusiastically agreed. Really, we needed that coffee. Next thing you know, we were hurried out of our meeting space because the attendees for the next event were there. As we gathered up our belongings, we chuckled about the great friendships we’ve made because of Multiple Sclerosis. And I couldn’t help but smile a little more as I reflected on how in eight years I’ve become a baseball watching Springsteen fan who looks forward to co-leading a great meeting on the second Saturday of every month.